It is a life time dreams to come true. 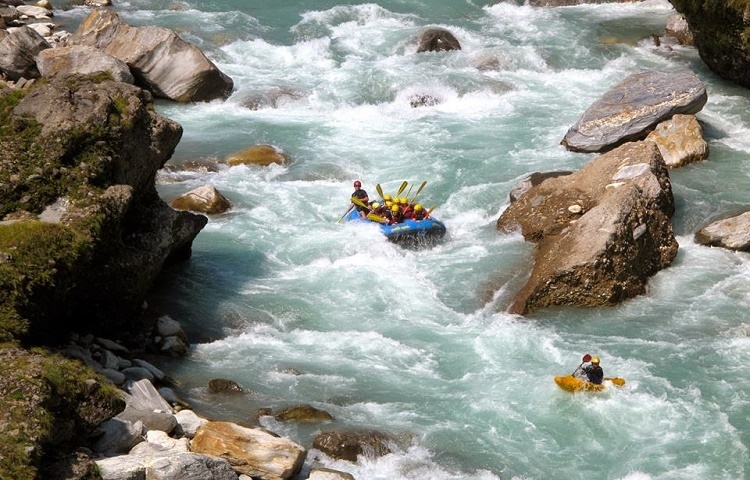 Kali Gandaki Rafting is aprecise thing for the terms Adventure and Daring. When you are at beach of kali Gandaki you can have glimpse of Annapurna range, different landscapes and green hills. All sorts of these things will certainly magnetize you. During the sight visit of pokhara you will glance of Sunrise view and Dhaulagiri, Annapurna I and Manaslu ranges from Sarangkot. Other additional are David fall, Phewa Lake, Seti River and so on. It is a short and gem trip to have adventure and daring of both Rafting and Pokhara trip. Your day starts travelling to Pokhara from Kathmandu. Overnight stay at Pokhara Lake site and hovering around there. Next day after having breakfast you will heads towards Kali Gandaki for rafting.Kali Gandaki is located at Beni of Myagdi district.You will reach Beni after a three hours journey by our private jeep. It will give you a chance to witness Kali Gandaki which is one of the deepest gorges in between Annapurna and Dhaulagiri Mountains. You will be doing rafting on these deepest gorges. You will be taught by our expert about padding skills. You will rafts from Little Brother to Big Brother rapids for about 3 hours. The foretaste of these thing is so mesmerizing and adventurous one. 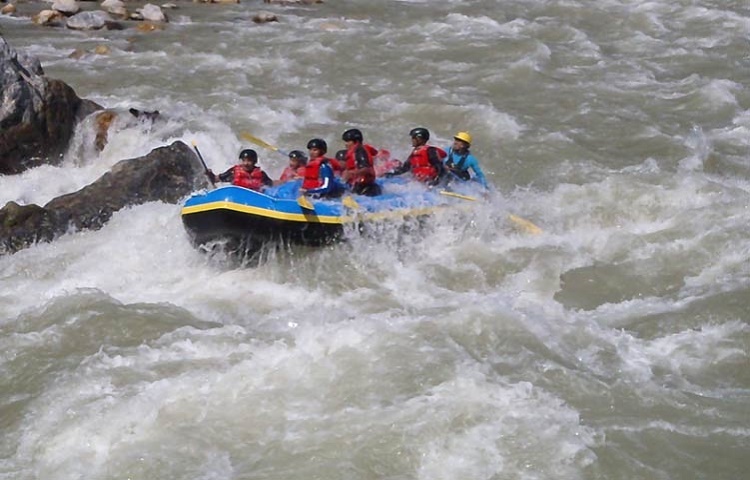 The absorbing fact of Kali Gandaki Rafting is that varieties of flora and fauna in jungle, stupas, bridges, shaligram stone inhabitant of magar and chettri villages and so on during the way. Return back to Pokhara at dusk. Next day start with sight visit in Pokhara you will have glance of Sarangkot through which you can witness from Sunrise view to Dhaulagiri, Annapurna I and Manaslu range. Other sight visit places also includes David Fall, Phewa lake,Bindhyabasini temple, world peace pagoda and gorge of Seti Rive. Day 3: At dawn you will be serve breakfast. Then you will be travelling to 200km route Pokhara through Bus . You can have sight seen of that locality which one is refreshing one. Overnight stay at Pokahra Lake side. You will be picked from an airport by our friendly staff. You will be moved to a Hotel in a vibrant city of Kathmandu, Thamel. Overnight stay at Thamel. At dawn you will be serve breakfast. Then travelling to 200km route Pokhara through Bus . You can have sight of that locality which one is refreshing and of different taste. Overnight stay at Pokhara Lake side. After having breakfast in the dawn you will forward your journey towards Kali Gandaki River located at Beni. It takes around 3 hours to reach Beni through bus. Our expert will train you about paddling skills,Safety drill - demonstration of throw-line and flip-line, adjustment of helmets, life jackets and so on. Training will start from novice level to expertise level. You will be headed towards Little Brother (-4), and Big Brother (+4) rapids .You will raft there for around 3 hours. After finishing rapids you will have light lunch at the beach of kali Gandaki. Then will return back to Pokhara at around 6-7 pm. Overnight stay at Pokhara Lake side. At dawn short drive to Sarangkot to have glimpse from Sunrise view to Dhaulagiri, Annapurna I and Manaslu ranges. Then you have a lunch at noon. Again you will go for sight visit of David Fall, Phewa lake,Bindhyabasini temple, world peace pagoda and gorge of Seti River. Overnight stay at Pokhara Lake side. After breakfast shopping around there in local market and return back to Kathmandu by Bus from Pokhara. Nearly 2 hours before your scheduled flight, our company representative will take you to the airport. We are sure that you will back to your home taking an amazing experiences of Nepal. We hope you enjoyed rafting of Kali Gandaki and sightseeing of Pokhara and want to be somewhere in the Himalayas again.